In the Ukrainian Chief Military Prosecutor’s book, it is okay for patriots (even whose hands are red with blood) to contravene the law. 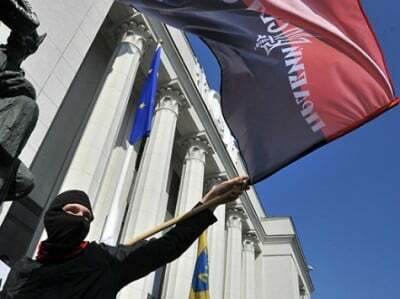 The extremist Right Sector fighters’ “patriotism” outweighs the fact that they are armed illegally and therefore they cannot be outlawed, Ukraine’s Chief Military Prosecutor said in an interview with Hromadske.tv. The governing group’s initial plan to use nationalistic sentiments to its advantage looks like it is now backfiring, as Poroshenko’s team has serious difficulties in controlling the genie they let out of the bottle.